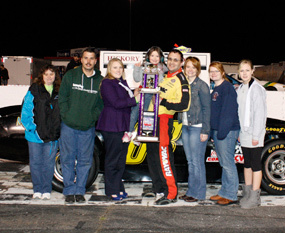 (Newton, NC - - March 27, 2010) It was a perfect spring night for racing at the Birthplace of the NASCAR Stars, as fans came out for the second edition of the NASCAR Whelen All-American Series. The night included appearances by all divisions featuring the Bojangles Late Models, the Advance Auto Parts Limiteds, the Everything Attachments Super Trucks, the Hickory Street Stocks, the Hickory 4-Cylinders and the Red Baron Race Parts Hobby Stocks. The night was definitely action packed, as several cautions flew and many drivers experienced early endings to their evening. The No. 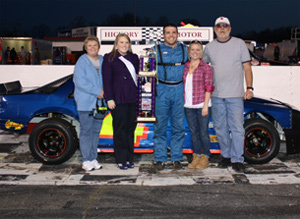 5 of Dexter Canipe Jr. didn't experience the same misfortune as many others, as he found his way back to Victory Lane during the Bojangles Late Model 50 lap feature event. It was an eventful 50 lap feature for the Bojangles Late Models. The No. 88 of Kyle Mansch pulled into the lead from the outside line on lap three, taking over the spot from the pole sitter, the No. 51 of Josh Wimbish. The No. 43 of Jesse LeFevers quickly pulled into the third place position on lap four, taking over the spot from the No. 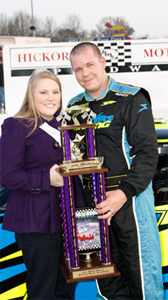 10 of, 2009 Hickory Motor Speedway Track Champion, Andy Mercer. By lap 22, LeFevers had made his way to the bumper of Wimbish looking to take over second. On lap 23 Wimbish slid up the track allowing LeFevers to slide by grabbing the second place position on lap 25. The first caution of the feature came out lap 26 as track officials inspected the track for debris. The second caution was soon to follow as Wimbish spun out on the back stretch on lap 27. The restart proved to be beneficial for the No. 92 of Candace Muzny, as she started in fourth and quickly took over third from the No. 36 of Neil Meredith. On lap 32 the No. 7 of Ashley Huffman and the No. 3 of Jessica Brunelli connected heading into turn two. Both cars continued on and no caution was called. The third caution was brought out on lap 35 for debris clean-up from the Huffman-Brunelli incident. The fourth caution was soon to follow after the No. 4 of Katie Hagar got loose coming out of turn two. Hagar spun down the back stretch collecting the No. 81 of Jeremy Burns. At the restart the No. 5 of Dexter Canipe Jr. moved into third, while Mansch took back the lead, putting LeFevers in second. LeFevers didn't back off however, as he pulled back along-side Mansch looking for his chance to get back out front. Mansch and LeFevers bounced off each other as they sailed into turn four, sending Mansch up the track. Canipe Jr. pulled up behind LeFevers pushing him to the lead, while grabbing the second place spot for himself. As the field headed into turn two on lap 44, Mansch got loose and spun on the back stretch collecting Mercer, Hagar and Burns. The wreck brought out the fifth caution and the first red flag of the night, and brought an early end to Mercer's evening. Canipe Jr. jumped back to the lead at the restart. With five laps to go, LeFevers squeezed under Canipe Jr. as they headed out of turn four to regain the lead. Only two laps remained when caution number six came out after Hagar spun out in turn two. During the caution, race leader, LeFevers pulled into the pits after experiencing mechanicals issues, ending his night prematurely. LeFevers misfortune, allowed Canipe Jr. to move into the lead. The field bunched up as they headed out of turn four on the restart. Brunelli bounced off the wall, lost a tire, and shot down the track collecting Muzny on the front stretch. The wreck brought out the seventh and final caution and the second red flag of the race. Canpe Jr. took the lead for the final restart, leading the field around the historic track for two final laps. Canipe Jr. was able to hold off the No. 19 of Kyle Moon for the lead and his second Bojangles Late Model win of the season. Meredith, Wimbish, and Huffman made up the top five. The Advance Auto Parts Limiteds put on a clean show as the 17 car field hit the track for a 35 lap event. The No. 14 of Brandon Cox found himself in a familiar position, starting the race on the pole, but fell prey to the No. 5 of Dexter Canipe Jr. on the first lap. The one and only caution fell on the first lap as the No. 66 of Travis Byrd spun out as the field headed out of turn four. As the race went green, it was Canipe Jr. who had the lead, but the No. 35 of Chris Lewis was hot on his tail. On lap 20 Lewis got a nose under Canipe Jr., and backed off as the two came upon lap traffic. Once the two cleared lapped traffic Lewis got back under Canipe Jr. on lap 23. Lewis got his nose under Canipe Jr. for a second time as they headed into turn one, Lewis completed the pass for the lead as they headed out of turn four. After taking the lead Lewis pulled away from the field seeking out his first win. “It's the first win for myself anywhere in any kind of racing… this is awesome for my family,” exclaimed an excited Lewis in Victory Lane. With ten laps remaining Cox moved under Canipe Jr. taking over the second place position leaving Canipe Jr. to settle for third. The No. 8 of Mark McIntosh and the No. 69 of John Hilliker rounded out the top five. It was a clean event for the Everything Attachments Super Trucks, as the race went green for the full 35 lap event. The No. 69 of pole sitter Trevor Hignutt and the No. 16 of Clint Fields maintained a tight battle for the top spot until lap four, when Fields cleared Hignutt for the lead on the back stretch. Meanwhile another great battle was in play as the No. 98 of Jody Measamer and the No. 68 of Michael Cooper fought for the third place position. Measamer powered ahead settling into third, leaving Cooper to ride around in fourth. The No. 6 of Brandon Sezter ended his night early, as he pulled off the track on lap 19 due to mechanical issues. With ten laps to go, another battle was brewing between the No. 11 of Thomas Beane and the No. 44 Ron Hall for the sixth place position. Five laps remained as Beane pulled into the position and pulled away from Hall. Fields came home with the top spot followed by Hignutt, Measamer, Cooper and the No. 33 of Jeremy Birch completed the top five. It didn't take long for the first caution and red flag to fall during the Hickory Street Stock 30 lap event, as the No. 99 of Jonathan Smith spun out heading into turn three. The spinning ride of Smith caused minor damage to the No. 29 of Joey Everhart and major damage to the No. 52 of Jonathan Goodwin, bringing Goodwin's night to an early end. It was a smooth restart with the No. 1 of pole sitter Taylor Stricklin in the lead. The No. 25 of Jeremy Pelfrey was on fire as he pulled up along-side Stricklin and took over first place on lap two. The No. 03 of Kevin Eby, the No. 64 of Marshall Sutton and the No. 7 of Jeff Saprks sailed by Stricklin by lap seven, leaving Stricklin to ride around in fifth. Stricklin wasn't prepared to settle for fifth, as he passed Sparks on the back stretch on lap 15 moving up to fourth. With five to go Eby pulled under Pelfrey and took over the lead. Pelfrey stayed on Eby's bumper looking for any opportunity to move back out front. Pelfrey looked high and low during the final laps, but he just didn't have enough to move back into the top spot. Eby would come home with the checkers, followed by Pelfrey, Sutton, Stricklin and Sparks. 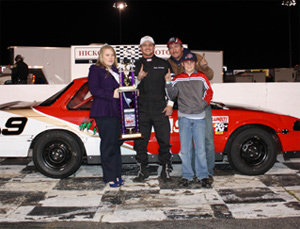 The Hickory 4-Cylinders ran a smooth 25 lap race. Just like the Limiteds, the first and only caution fell early in the race before the first lap was complete. The No. 59 of Don Wardo spun around heading into turn four, bringing out the yellow flag. From the restart the No. 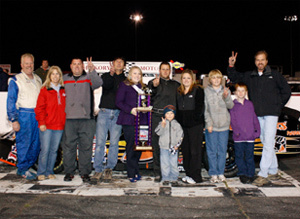 4 of pole sitter Adam Beaver was on fire as he led the field around America's Most Famous Short Track. It was a game of follow the leader, with Beaver out front. The No. 16 of Randy Freeze, the No. 09 of Randy Canipe, the No. 98 of Rob Lewis and the Wardo completed the top five respectively. The Red Baron Race Parts Hobby Stocks capped off the evening with a 20 lap, caution free event. The No. 9 of Wayne Harrington started the race in the pole position and maintained the lead to the end. The No. 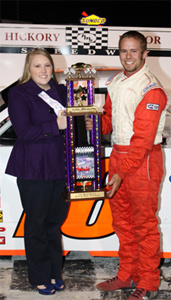 44 of Jeremy Rowe experienced a good night on the track as he moved up to the second place position early in the race. Rowe got a little hot heading out of turn four on lap 16 getting side-ways on the front stretch. Rowe was able to hold on tight to his ride and keep from wrecking. After the incident, Rowe fell off the pace, allowing the No. 88 of Andrew Towery the opportunity to pull ahead and move into second, leaving Rowe to finish third. The No. 84 of Steve Teague and the No. 28 of Casey Pierce rounded out the top five. The drivers of the NASCAR Whelen All-American Series will be back in action on Saturday, April 10. The night will feature the Bojangles Late Models, the Advance Auto Parts Limiteds, the Everything Attachments Super Trucks, the Hickory Street Stocks and the Hickory 4-Cylinders. Grandstands open at 5PM with qualifying immediately following. An On Track Autograph Session will take place at 6PM and feature racing begins at 7PM. Tickets are only $10 for adults, $8 for teens and seniors, $5 for kids ages 7-12, with kids ages 6 and under FREE! Family passes are available for $25 and include two adult tickets and tickets for all kids 12 and under. 1 (5) Dexter Canipe Jr.